Architectural projects emerge through a series of phases. 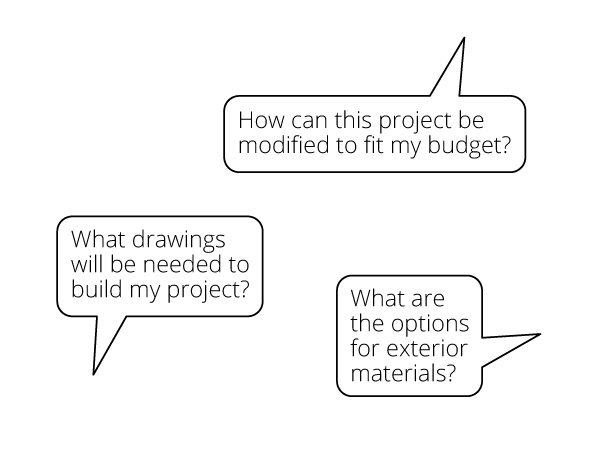 These phases may overlap, and certain phases may not be necessary for a particular project. Each phase informs the next, sometimes opening up new possibilities, other times uncovering new challenges. Our fee proposals and project schedules correspond to the work required for each anticipated phase. • Evaluate the viability of a building, or whether a project is suited to a particular building or space. • Undertake an interactive process to define the needs, goals, and overall vision for a project. • Create a strategy for phasing the work over a period of time if there are budget or time constraints. • Perform preliminary zoning research, to determine what is allowed and what will require a variance process. 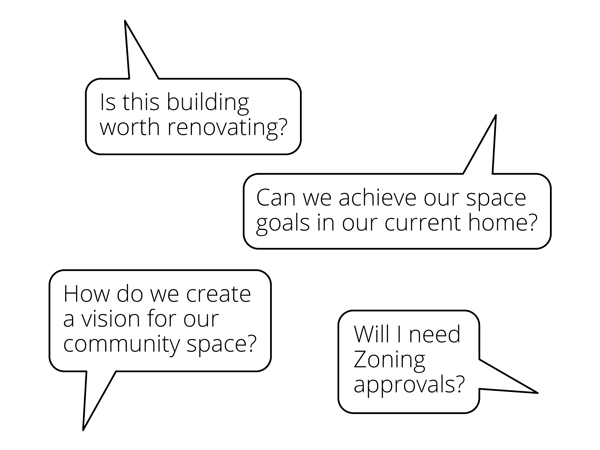 We begin our design process with careful listening and comprehension of our clients’ needs and goals. We either receive, or help develop, the architectural program, which quantifies and characterizes the kinds of spaces required. We consider energy uses and the potential for high efficiency (green) building. The site, or existing building (in the case of a renovation) is documented and analyzed for its potential. Finally, we produce sketches, views, and/or models of several design options. 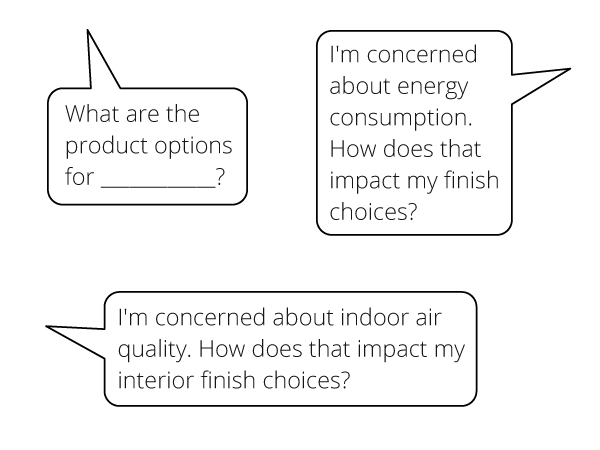 Based on meetings and feedback, we will revise or refine these design ideas to create the final schematic design. We can offer general cost projections at this point based on recent projects of similar size and scope. In this phase, the final schematic design is taken further and developed into preliminary construction documents. More information is added to the drawings and we select important elements, such as windows, doors, and plumbing and electrical fixtures. 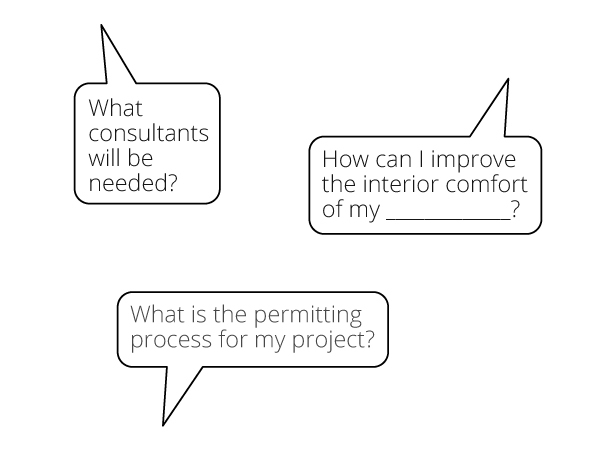 Structural, mechanical, landscape, or other consultants may be brought in to produce their design documents. Written schedules and specifications, defining all of the materials, are produced for larger projects. These documents will be sufficient for a preliminary cost estimate from a contractor and to apply for permitting. Interior design includes the selection and integration of specific finish materials (i.e. flooring, tile, fabrics), color, decorative lighting, built-in elements and furniture. This work spans between several phases – with some decisions made early on, and others happening during construction. Clients vary considerably in terms of how much interior design is desired for each project. The final construction documents are the drawings the contractor will use to build the project. This includes additional drawings, construction details, and specifications to fully explain and represent all aspects of the project. We become very specific about sizes and locations of elements including mechanical, electrical, and plumbing equipment, and the structural design is finalized. If the project has been rejected by a permitting agency, or is deemed to be too expensive, revisions are made. 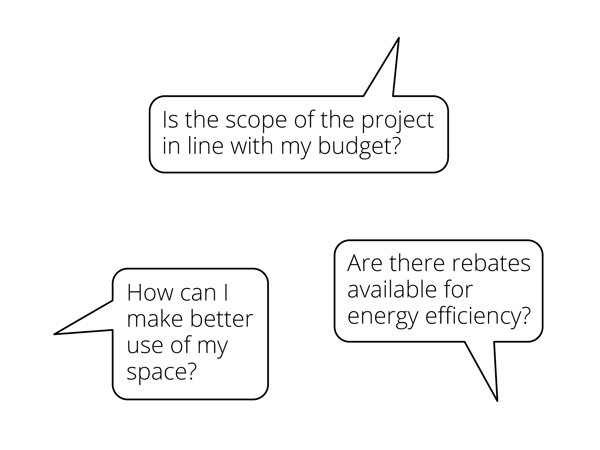 The final pricing process- negotiated or competitive bidding – will be based on these drawings. During this phase, we assist our clients in identifying contractors; often referring contractors we already have a working relationship with. We analyze and compare bids and other considerations to help select the best fit for the client and project. We maintain a regular presence on the construction site and are in continuous communications with the contractor and client during construction. 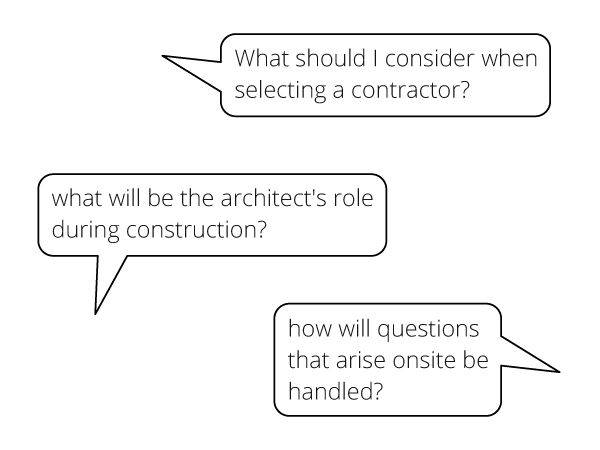 Specific drawings or details may be produced in response to a contractors questions or client-requested changes. We review and sign-off on contractor requests for payments. Finally, we review the finished project to approve or reject work.